Given at 12.15 Rome time today, the text of the Pope's ad limina speech to the English and Welsh bishops has dropped... and in a word, it's unusually short. After confirming his "forthcoming" visit to Britain -- but leaving out the trek's already well-circulated September dates -- B16 lowered the boom on several fronts, panning an equality bill currently before Parliament that, according to some interpretations, could make a male-only priesthood illegal and would ban moral considerations from personnel decisions; urging the prelates to present and defend the church's moral teaching "in its entirety"; noting that "it is important to recognize dissent for what it is, and not to mistake it for a mature contribution to a balanced and wide-ranging debate," and adding a notable call for cohesion in observing that "if the full saving message of Christ is to be presented effectively and convincingly to the world, the Catholic community in your country needs to speak with a united voice." I welcome all of you on your ad Limina visit to Rome, where you have come to venerate the tombs of the Apostles Peter and Paul. I thank you for the kind words that Archbishop Vincent Nichols has addressed to me on your behalf, and I offer you my warmest good wishes and prayers for yourselves and all the faithful of England and Wales entrusted to your pastoral care. Your visit to Rome strengthens the bonds of communion between the Catholic community in your country and the Apostolic See, a communion that sustained your people’s faith for centuries, and today provides fresh energies for renewal and evangelization. Even amid the pressures of a secular age, there are many signs of living faith and devotion among the Catholics of England and Wales. I am thinking, for example, of the enthusiasm generated by the visit of the relics of Saint Thérèse, the interest aroused by the prospect of Cardinal Newman’s beatification, and the eagerness of young people to take part in pilgrimages and World Youth Days. On the occasion of my forthcoming Apostolic Visit to Great Britain, I shall be able to witness that faith for myself and, as Successor of Peter, to strengthen and confirm it. During the months of preparation that lie ahead, be sure to encourage the Catholics of England and Wales in their devotion, and assure them that the Pope constantly remembers them in his prayers and holds them in his heart. Your country is well known for its firm commitment to equality of opportunity for all members of society. Yet as you have rightly pointed out, the effect of some of the legislation designed to achieve this goal has been to impose unjust limitations on the freedom of religious communities to act in accordance with their beliefs. In some respects it actually violates the natural law upon which the equality of all human beings is grounded and by which it is guaranteed. I urge you as Pastors to ensure that the Church’s moral teaching be always presented in its entirety and convincingly defended. Fidelity to the Gospel in no way restricts the freedom of others – on the contrary, it serves their freedom by offering them the truth. Continue to insist upon your right to participate in national debate through respectful dialogue with other elements in society. In doing so, you are not only maintaining long-standing British traditions of freedom of expression and honest exchange of opinion, but you are actually giving voice to the convictions of many people who lack the means to express them: when so many of the population claim to be Christian, how could anyone dispute the Gospel’s right to be heard? If the full saving message of Christ is to be presented effectively and convincingly to the world, the Catholic community in your country needs to speak with a united voice. 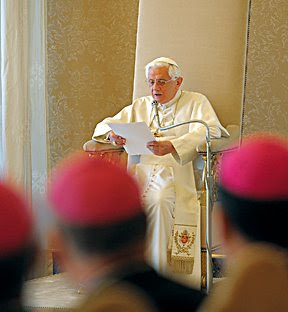 This requires not only you, the Bishops, but also priests, teachers, catechists, writers – in short all who are engaged in the task of communicating the Gospel – to be attentive to the promptings of the Spirit, who guides the whole Church into the truth, gathers her into unity and inspires her with missionary zeal. Make it your concern, then, to draw on the considerable gifts of the lay faithful in England and Wales and see that they are equipped to hand on the faith to new generations comprehensively, accurately, and with a keen awareness that in so doing they are playing their part in the Church’s mission. In a social milieu that encourages the expression of a variety of opinions on every question that arises, it is important to recognize dissent for what it is, and not to mistake it for a mature contribution to a balanced and wide-ranging debate. It is the truth revealed through Scripture and Tradition and articulated by the Church’s Magisterium that sets us free. Cardinal Newman realized this, and he left us an outstanding example of faithfulness to revealed truth by following that "kindly light" wherever it led him, even at considerable personal cost. Great writers and communicators of his stature and integrity are needed in the Church today, and it is my hope that devotion to him will inspire many to follow in his footsteps. Much attention has rightly been given to Newman’s scholarship and to his extensive writings, but it is important to remember that he saw himself first and foremost as a priest. In this Annus Sacerdotalis [Year for Priests], I urge you to hold up to your priests his example of dedication to prayer, pastoral sensitivity towards the needs of his flock, and passion for preaching the Gospel. You yourselves should set a similar example. Be close to your priests, and rekindle their sense of the enormous privilege and joy of standing among the people of God as alter Christus. In Newman’s words, "Christ’s priests have no priesthood but His … what they do, He does; when they baptize, He is baptizing; when they bless, He is blessing" (Parochial and Plain Sermons, VI 242). Indeed, since the priest plays an irreplaceable role in the life of the Church, spare no effort in encouraging priestly vocations and emphasizing to the faithful the true meaning and necessity of the priesthood. Encourage the lay faithful to express their appreciation of the priests who serve them, and to recognize the difficulties they sometimes face on account of their declining numbers and increasing pressures. The support and understanding of the faithful is particularly necessary when parishes have to be merged or Mass times adjusted. Help them to avoid any temptation to view the clergy as mere functionaries but rather to rejoice in the gift of priestly ministry, a gift that can never be taken for granted. Ecumenical and inter-religious dialogue assume great importance in England and Wales, given the varied demographic profile of the population. As well as encouraging you in your important work in these areas, I would ask you to be generous in implementing the provisions of the Apostolic Constitution Anglicanorum Coetibus, so as to assist those groups of Anglicans who wish to enter into full communion with the Catholic Church. I am convinced that, if given a warm and open-hearted welcome, such groups will be a blessing for the entire Church. With these thoughts, I commend your apostolic ministry to the intercession of Saint David, Saint George and all the saints and martyrs of England and Wales. May Our Lady of Walsingham guide and protect you always. To all of you, and to the priests, religious and lay faithful of your country, I cordially impart my Apostolic Blessing as a pledge of peace and joy in the Lord Jesus Christ. For Mahony, Twilight... and "Shadow"
The Road to "Red Dawn"
"Even In Our Darkest Hour...."
For Comm. Day, the Pope Says "Blog"